This gorgeous half-up style incorporates twisted braids while letting hair cascade down — and it only takes a handful of minutes to master. Whether you have short or long locks, this easy breezy summer style will work for you and can be worn from day to night. 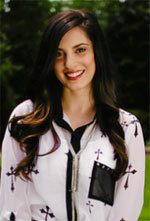 Jessie Holeva is a fashion stylist, on-air style expert and freelance writer based in Philadelphia. She can be seen talking style on QVC and works with Simon Malls as its King of Prussia Style Setter & personal shopper. Jessie started freelance writing in high school, before working as an on-air DJ in radio during her college years, where she developed her love for fashion reporting. In 2010, her idea sparked to create a her own outlet to share her obsession for finding the latest trends for less, TrendHungry.com. Her blog spun off into a syndicated radio segment, Trend Hungry Tuesday, airing on WPLJ’s Ralphie Tonight. Jessie enjoys nail art, chocolate and collecting vintage costume jewelry. Follow her fashionable adventures in real time on Twitter and Instagram @jessieholeva.